An ad for pet rats. We are directed to a loft in downtown LA. I ask for the rats; a friendly scientist shows us around, Angel crawls down the rocks around the balcony. The woman gives us a circular steel box containing the rats and we leave. In the car, I open the container, excited for baby rats. I find a slather of bloody tadpole looking things swimming about. I dip my fingers in and lift some out, some slip thru and disappear in the darkness. The tadpoles rapidly multiply as I watch, and I close the container. In my bunkbed at the old apartment. I’m sad that none of the tadpoles became rats. 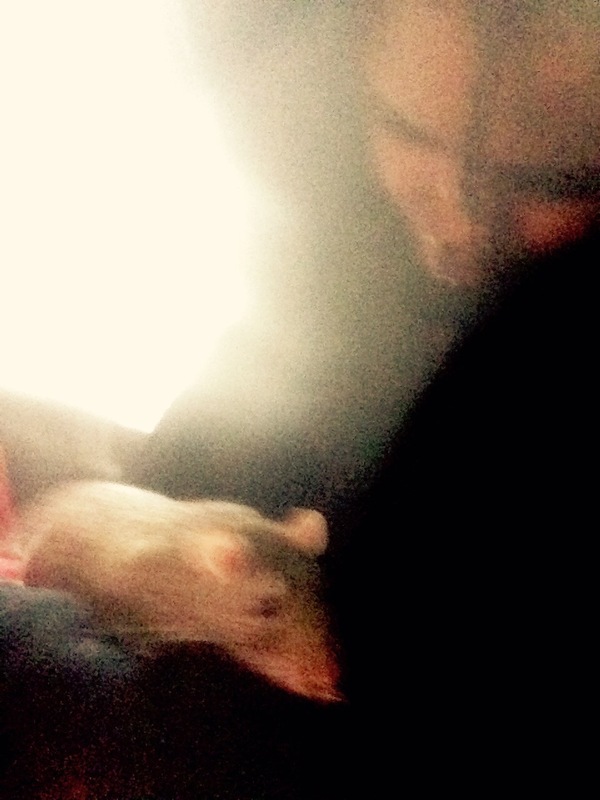 Pic is my ratbaby n me. R.I.P. Septimus. Need a new living space. My dear friend M points me to this old witch’s house where she and our friend A are also moving in, I’m elated. We are gathered in some sort of introductory meeting, the room is filled with all sorts of herbs and artifacts, there’s a fire behind the old lady. She notices I’m barefoot and tells me in a fairly authoritative tone it’s important to wear socks in this house. I say nothing and kinda give M a wtf? look; she smile-shrugs and gives me a pair of purple toe coverings. Not quite socks, more like little tubes of cloth that cover the ball of my feet. I’m confused. I pull some footless tube socks over the bottom of my feet to have some semblance of a sock. Earlier, we are going to pick up a friend from her job in a high rise building, I guess she’s sick of it and wants out? She runs past us with a mold-covered towel draped over her head, we aren’t super phased.